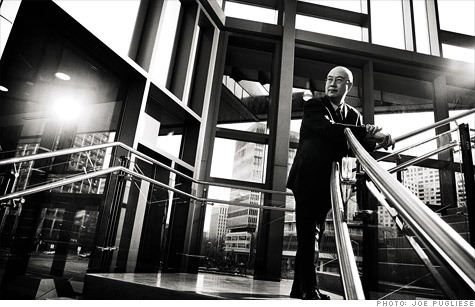 Wild markets are here to stay argues Andrew Lo, an economist and finance professor at M.I.T. 's Sloan School of Management. (MONEY Magazine) -- You know that investing can be tough. Andrew Lo says it's even tougher than you think. Lo, an economist and finance professor at M.I.T. 's Sloan School of Management, challenges a core idea of financial theory: that markets are "efficient," meaning there's no point in trying to time your moves in and out of stocks, since everything you could know about them is already baked into the price. Plenty of smart people think that Lo knows what he's talking about. In addition to teaching, he has advised the government on ways to limit the damage from future financial crises. He also runs a money-management firm that seeks to put his ideas to work. Lo argues that the buy-and-hold method of investing (long considered gospel by index fund managers and this magazine) doesn't effectively limit the risks of today's markets. He explained his theories to contributor Charles P. Wallace; the conversation has been edited. You reject the theory of efficient markets in favor of what you call adaptive markets. Meaning? I don't entirely reject the idea of efficient markets. It needs updating. The adaptive markets hypothesis says that all economic institutions, like our own species, develop and change over time, depending on the population of investors that are engaged with them. In a normal market, you get the independent valuations of millions of buyers and sellers trying to evaluate a given security. When there's a strong trend upward, for example, the kind of skepticism that produces reasonable and accurate valuations of securities is not at work, and a bubble develops. It's very exciting when you're in the midst of it, but at some point the valuations aren't justifiable. It seems as if big market shifts are becoming more common. Yes. If you rank the top 50 one-day moves in the S&P 500, a fair number of those happened within the last five or 10 years. That tells you that we're in a different, riskier market now. A combination of a lot of smart guys and technology. People have the ability to enact a trade instantaneously. And they have a lot of complex new tools, such as hedge funds and derivatives, at their disposal. Technological innovations often have unintended consequences. My analogy is someone clearing some brush using a handsaw. You can clear a lot more brush using a chainsaw, but you might lose a finger, or suffer other attendant consequences. We now have everybody with chainsaws going after all sorts of opportunities, and that's really where the potential for crises can emerge. Until we've learned how to develop better technologies, I think we're going to keep seeing more crises. There's a good chance we'll see a pretty important shock wave coming out of Europe if they don't get their act together with regard to European sovereign debt. But doesn't a simple buy-and-hold strategy address a lot of these issues of risk? Buy-and-hold doesn't work anymore. The volatility is too significant. Almost any asset can suddenly become much more risky. Buying into a mutual fund and holding it for 10 years is no longer going to deliver the same kind of expected return that we saw over the course of the last seven decades, simply because of the nature of financial markets and how complex it's gotten. Okay, but even during the so-called lost decade (2000 to 2010) someone who regularly put money into a 60% stock/40% bond portfolio would have had about a 4% return. Why isn't that good enough? Think about how that person earned 4%. He lost 30%, saw a big bounce-back, and so on, and the compound rate of return over the period was 4%. But most investors did not wait for the dust to settle. After the first 25% loss, they probably reduced their holdings, and only got part way back in after the market somewhat recovered. It's human behavior. Ask actual individual investors what their net rate of return was over the last three years, and see if it's the same rate returned by the market. I bet you it's not. So what choice do I have instead? We're in an awkward period of our industry where we haven't developed good alternatives. Your best bet is to hold a variety of mutual funds that have relatively low fees and try to manage the volatility within a reasonable range. You should be diversified not just with stocks and bonds but across the entire spectrum of investment opportunities: stocks, bonds, currencies, commodities, and domestically and internationally. Most of us didn't sign up for the kind of volatility we're seeing right now. So keep in mind that if you're holding equities, you are probably taking more risk than you thought. Does the government have a role in preventing these crises? It's not possible to prevent financial crises. But we can better understand what they are caused by, when they are likely to occur, and how we can prepare for them when they do happen. In the same way you cannot legislate away hurricanes, but you can do a lot to prepare for the worst of their effects. I believe we should have an independent agency to study crises, the way the National Transportation Safety Board looks at airline crashes. Some 2,000 pages of regulations came out of the last crisis. The Dodd-Frank Bill [which significantly strengthened financial regulations] was like a "Fire, ready, aim." It was a reaction. Now, some of that reaction was quite useful. But the laws that have been proposed, like the Volcker Rule [which would prevent banks from making some speculative investments], have hosts of unintended consequences that we won't really understand for years until after those laws are actually implemented.